This realistically shaped firearm simulator from the Rings Blue Gun line replicates the Smith & Wesson M&P 40 Compact. It is available in two versions, an unweighted model and one that also recreates the weight of the real firearm, providing even greater realism during weapon handling training. 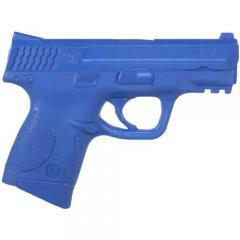 Its urethane material is tough and impact-resistant for repeated use in high-intensity law enforcement and military training scenarios, and its blue color makes it impossible to mistake it for a functioning pistol. The replica is completely inert, so trainees can use it without the risk of injury.